"Essential oils by CADE are produced by distilling method (steaming). As a result, 100% natural highest quality and purity oils are obtained. " an effective remedy against hair loss and the formation of dandruff. cosmetology: effective in treatment of inflammations, eczema, fungal infections, improves the skin condition. cleans and disinfects the air indoors. cosmetics- effective in treatment of inflammations, eczema, fungal infections, diminishes broken facial capillaries, improves skin condition. inhibiting plant pests and diseases. For room perfuming: in a spryer dissolve 5-10 drops of essential oil in 50 ml of water. Shake and spray on carpets, curtains, furniture. For baths: 5 - 10 drops of essential oil must blended with 50 ml of milk, honey, bath foam or salt and then added to bath water. Important! Do not drop the oil directly into water! Cold or warm compresses: add 5-7 drops of essential oil to cold or hot water (temperature should not exceed +60 C° to avoid burns). Moisten a gauze or cotton cloth in the solution of essential oil and water and apply it over the sore area. It is important not to remove the compress until the temperature of the cloth patch gets equal with the temperature of the body. In case of serious diseases or severe pain, always consult your physician before using the compresses! 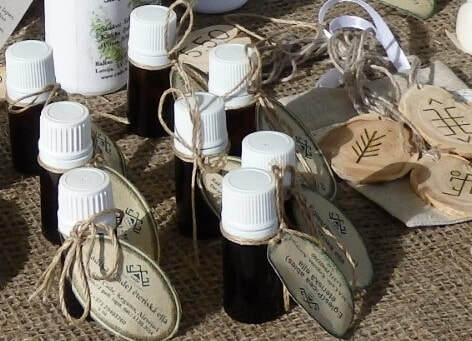 Massages: for massages use only diluted essential oils. Dissolve 1-5 drops of essential oil in 20 ml of massage-intended vegetable oil (for ex., almond kernel or grape-seed oils). Before massage, it is mandatory to test the mixture to avoid a possible allergic reaction! Perfuming of cosmetics: add 1 - 4 drops to the cosmetic product. Before adding it is mandatory to test the oil against a possible allergic reaction! Inhalations: add 5-7 drops of essential oil into a bowl of boiling water and inhale the vapors. Important! Do not forget to close your eyes in order to avoid burns! Warning: To be used with caution during pregnancy, breast-feeding and for infants and children up to three years! Each product must be tested for individual sensitivity. Avoid getting into your eyes! The oil must be stored in a cool place, it is not recommended to store it for more than 2 years!